Over recent weeks we have observed the departure of the thousands of Plumed Whistling-Ducks from the Broome Poo Ponds and now there are only a few hundred present. The Crimson Chats are now further from town, but Yellow Chats are still not far away in the salt-bush. 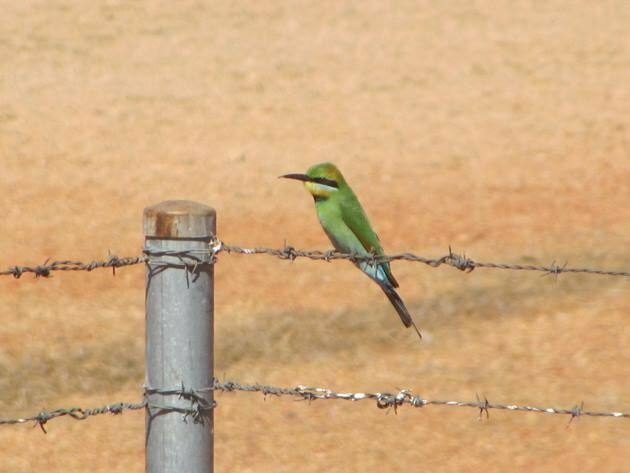 The barbed wire around the ponds is now the perfect roost for the Rainbow Bee-eaters that we see on a regular basis around Broome. We have observed them nest in a hollow they have dug in the gravel sides of the track around the Poo Ponds in recent years, but with the upgrade to the track they are no longer able to do that. 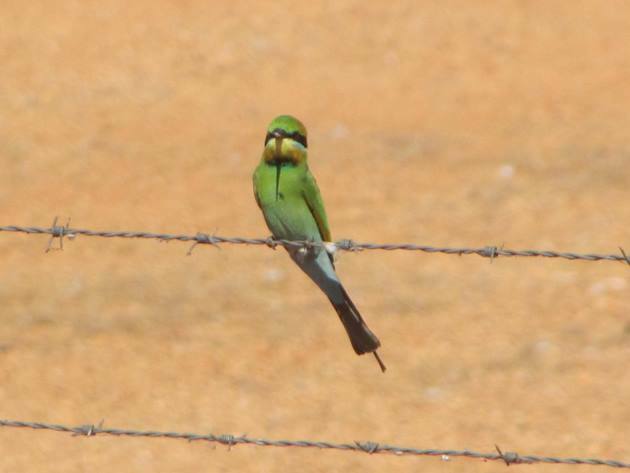 The Poo Ponds offers plenty of insects for the Rainbow Bee-eaters to eat and they can often be seen swooping in front of the Barndarlmarda Hut. 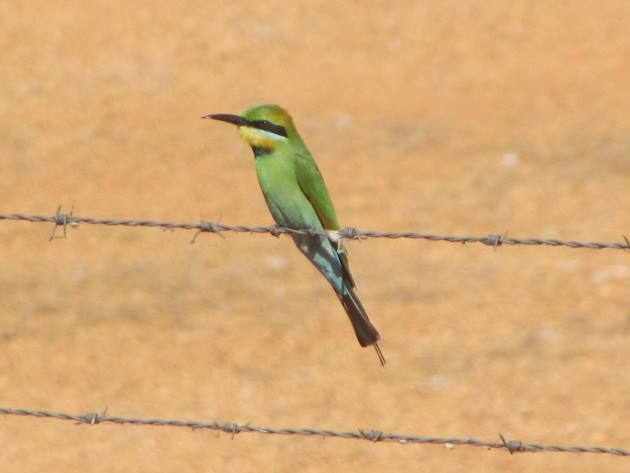 You can stand in the shade in the hut and observe the feeding and balancing act along the barbed wire fence of numerous Rainbow Bee-eaters and hope for a few photos! The female Rainbow Bee-eater has shorter tail feathers than the male, but otherwise their colourations are similar. They are not always as brightly coloured as these birds, with young birds being quite dull and not having the black on the breast or the tail feathers. 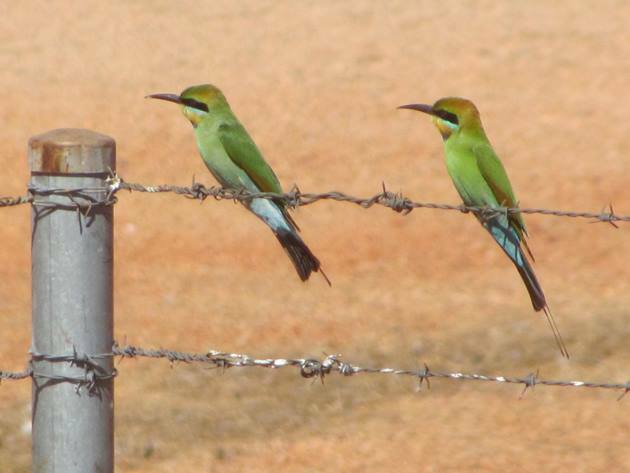 The Rainbow Bee-eaters we were observing on our last visit to the Poo Ponds were constantly swooping for insects and they then bash the insects on the fence before consuming them. Often in the bush you hear a bashing sound and discover it is a Rainbow Bee-eater bashing an insect on a branch before consumption. 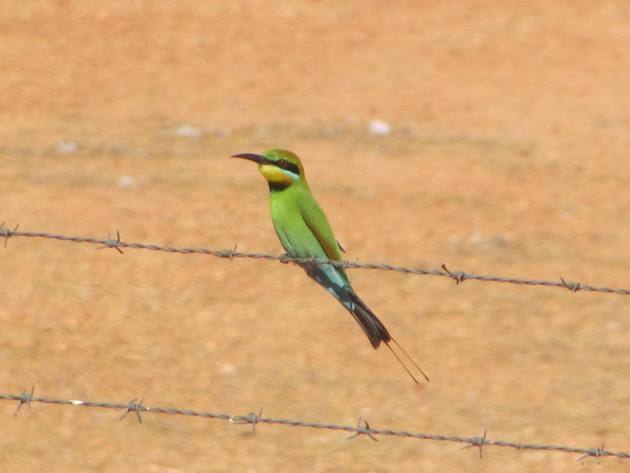 Tom observed Rainbow Bee-eaters eating dragonflies only a few weeks ago! 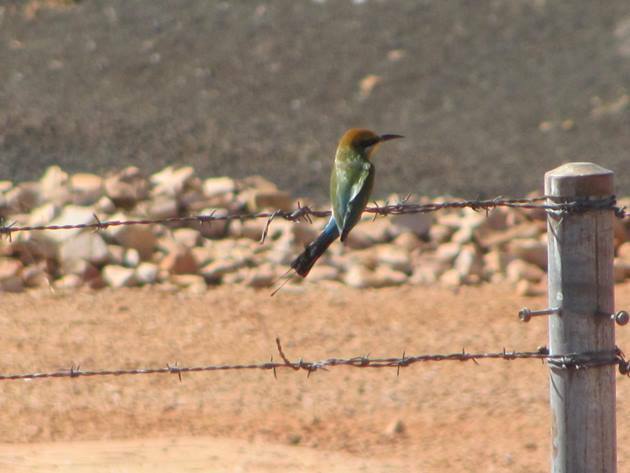 The male Rainbow Bee-eater had substantially longer tail feathers and also balanced on the barbed wire fence in front of the hut. Finally the pair of Rainbow Bee-eaters landed close enough together for a moment for me to capture them side by side on the barbed wire and within a few seconds they took off again chasing insects. The breeze was proving rather tricky when the Rainbow Bee-eaters landed, but they were able to overcome the breeze with some careful balancing. 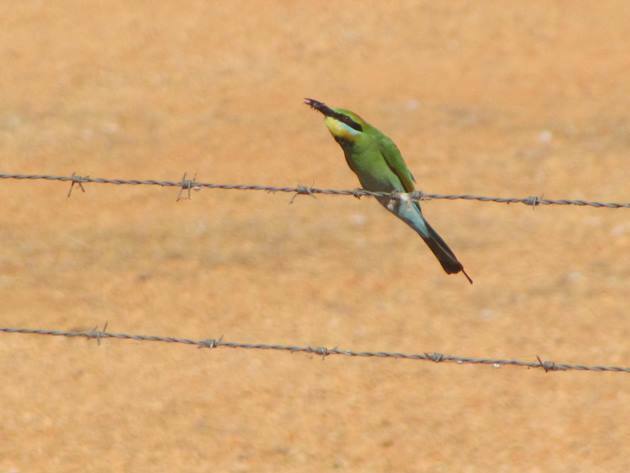 The barbed wire fence is very useful to the Rainbow Bee-eaters around the Poo Ponds at the moment. On dusk we often observe huge flocks of Rainbow Bee-eaters as they head to roost for the night. Rainbow Bee-eaters are wide-spread across most of Australia apart from the desert areas and as you can see they are a beautifully colourful bird to encounter. There may well be less ducks at the Poo Ponds now, but there are always other birds to delight the observer! They are stunning! How funny you can hear them bashing their insects before you even see the birds. They really are quite rough when it comes to dispatching of insects!